On Saturday, May 10, club members met in Taberg to stock fish donated to the club by the Ed Weed Fish Cultural Station in Vermont. All the club had to do was to provide for testing and transportation. 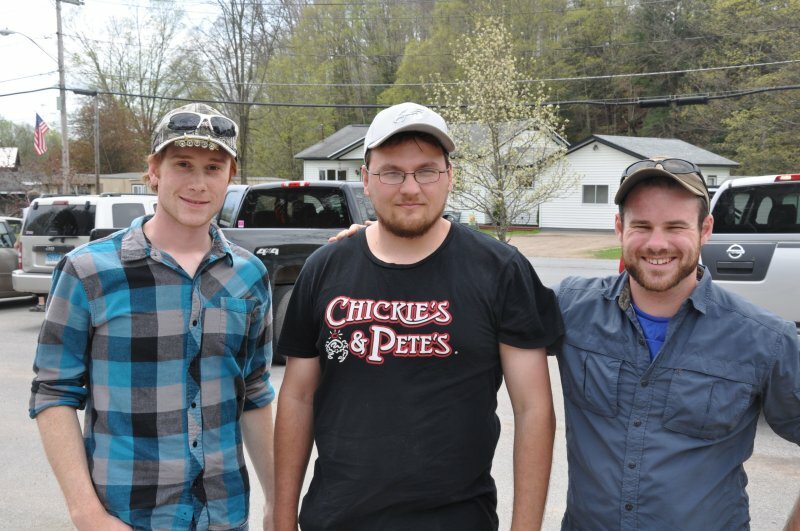 Tom Schneider and his brother Mike rented a truck and drove to Vermont on Friday to pick up the fish. 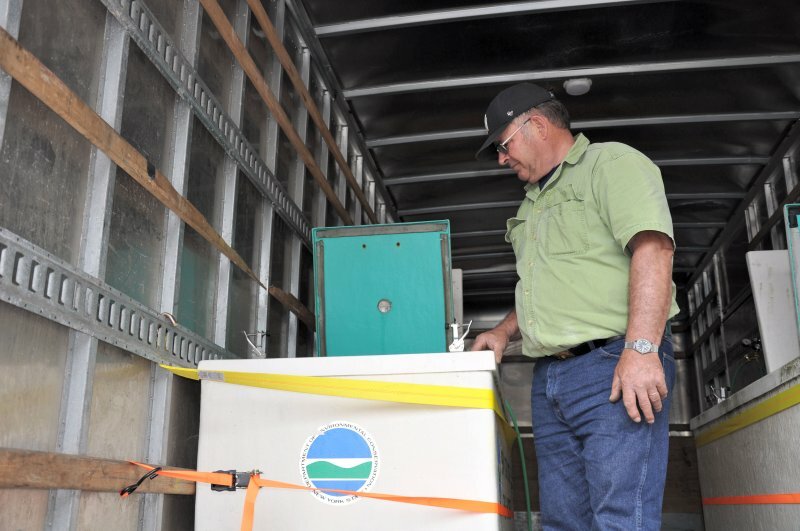 Two tanks were borrowed from the Rome State Fish Hatchery for the purpose of transporting the fish and oxygen was supplied to the fish while in transit. The fish arrived in good shape with little mortality. The water in the tanks were tempered by dumping some of the water out and replacing it with water from the stream. 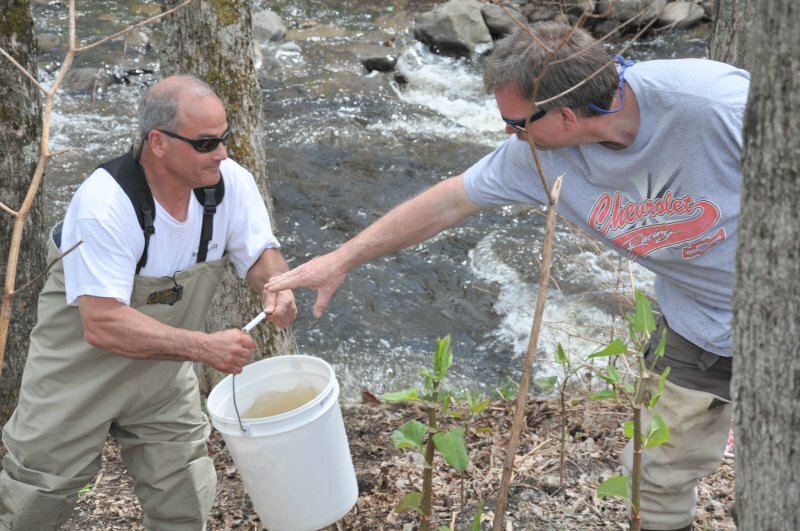 The club obtained permisssion from the land owners and the fish were stocked in the East Branch of Fish Creek in and around the hamlets of Taberg and Blossvale. The weather was perfect and everyone apparently enjoyed the outing. The river had risen a foot from the previous day and the flow was about 1500 cu ft/sec so we were extra cautious about wading in the water. Thanks to everyone who had a hand with putting fish in the water. We could not do this work without volunteers. The club had plenty of help with the stocking from land owners, boy scouts, students from ESF as well as club members. Mike Schnieder is here checking on the fish after arriving at the meeting place in Taberg, NY. Mike drove the truck to Vermont and back along with his brother Tom. There was little mortality on the trip from Vermont. A bucket brigade was set up to temper the water so that the water temperature of the tank water matched that of the water in the river. The state hatchery in Rome, NY were kind enought to loan us the use the tanks for the fish. Looking into the tank holding the fish you can see the hose to the oxygen supply. The difffuser at the bottom of the tank helps the oxygen to be absorbed into the water. 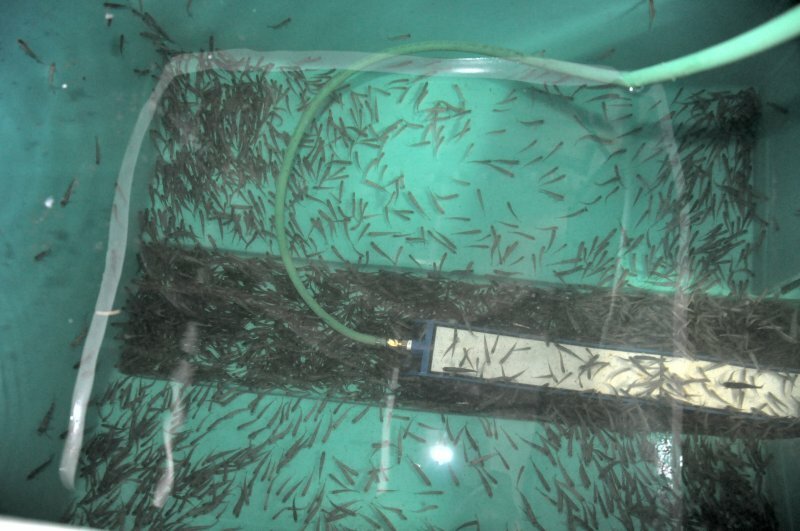 It is important to keep the water aerated as the fish tend to clump together at the bottom of the tank and they can and will smother themselves. A bucket brigrade organized itself to bring water up a steep slope to temper the water in the tanks with that of the stream. 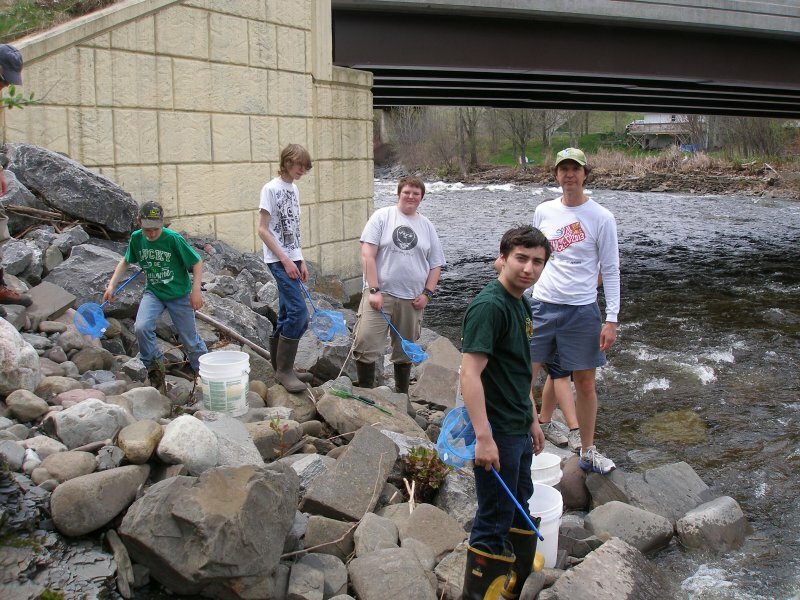 Shown are the students from the Enviromental, Science and Forestry (ESF) located in Syracuse, NY. Chris and Jason are doing field work for their degrees in the Fish Creek system. Shown are the boy scouts with their leader who helped with the stocking. One of the areas that were stocked. The water was too high to do much wading. Hazzards abound while stocking and include navigating steep banks,swift water and loose and slippery rocks. So we tell everyone that the fish can swim better than any human and that human safety is above the safety of the fish. Workers are emptying the tanks, making sure that all fish are recovered.